To someone who loves flowers and can’t seem to get enough of them - their colors, their scent, and their delicate cheer, this book has the effect of leaping off the stands and beckoning. Sharman Russell, a botanist (there goes another potential career of mine! ), shares my passion, but hers is elevated supremely by tying in science to adoration. She loves flowers to the extent that she has dedicated her life’s goals towards studying them and exploring their role in our living world. In this book, she lyrically describes the delicate and intelligent system of flowers, whose every form has a function, even their spell-binding beauty. 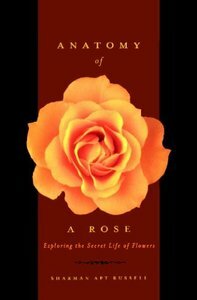 Her book is a beautiful ode on flowers. Sharman Russell primarily discusses the structure of flowers and their complex and significant role in the ecosystem, touching upon their deceivingly ornate, yet simple features that have meticulously evolved with natural selection’s uncanny and persistent design. But just as we begin to fear if the idealism behind flowers is going to be ripped apart only to leave exposed their selfish motive towards pollination, and well, reproduction, Russell’s mellifluous prose soothingly quells us, as she crafts a scientific poetry that awes us. Flowers change into a beautiful and intelligent kind - one that is resilient to the environment and knows how to adapt its form, color, texture, scent and even pollinators, to survive. Russell also weaves in the causal scheme of cooperation and competition by which plants operate; two mutually contradictory, yet essential components of survival. Without the mutual symbiosis between flowers and insects, both species suffer. Yet without competition between flowers and their neighbors, the fittest isn’t going to procreate. It was fascinating to read about flowers that time their blooming periods to ensure that they are not overshadowed by their flashy neighboring plants! And how aggressive the flowers are in their shapes, colors and scents to outshine their competitors. One of the things I loved about this narration was its focus on the pollinators - the bees, the wasps, the humming birds, birds and many other little creatures, and their drama of seduction with the flowers. Contrary to human being’s presumption, the colors and scents are not really meant for our senses, but are geared for the little agents. It is to lure them into their core, and provide nectar in exchange for disseminating their precious pollen. This, we all learned in middle-school, yes. But did you know why the majority of flowers are in bright yellows, and oranges? That a bee’s spectrum of visibility is slightly different from ours? That their yellows, oranges, whites and violets are different from our perception of those colors? I can’t bear to stand the fact that there are creatures who can see colors that I cannot even visualize! And with this, we are just grazing the tip of the iceberg of the mysteries surrounding all of nature, and human limitations in trying to solve them. As one botanist ponders - How does the bee experience the flower? How does the flower experience the bee? So many fundamental questions bordering on the elusive philosophical realm. Flowers that imitate other flowers and plants, flowers that bloom a certain time, flowers painted with colors to attract a certain pollinator, flowers with scents to beguile the unassuming pollinator, flowers that have deadly traps to punish selfish and greedy pollinators, flowers with defenses to protect their pollens and safeguard against self-pollination, flowers that help thrive our ecosystem.... and flowers that are now sitting in our homes, blooming and shedding their petals which were engineered to be of a certain color and to withstand temperatures asynchronous to the seasons. Humans enter the scene. I have never found a rose to carry a scintillating smell, and have often wondered why it was so celebrated for its scent. Well of course, artificially bred roses have discarded the need to produce scent... why work so hard to produce scent when there is no pressure to lure bees? Sigh... the very essence of nature now sits smiling at us with its hybridized unnatural-sized petals, and no scent. In the future, roses can be made to smell like lemons, they can be blue, and can be made to last for a long long time. Would it still be a rose to me? Would it still captivate me? And would the bees, the butterflies and our ecosystem be much the same? Tough questions, uneasy answers. We don’t know how to define the line between natural and unnatural. On the one hand it is exciting and on the other hand it is ominous. It’s an addition to the growing food for thought on preserving nature. Having rambled quite a bit, I must say that the one disappointing thing about the book was the lack of photographs or colored pictures of flowers to feast our eyes on, as we delve into their elegant design.